At a time when price means everything to consumers, Super Talent finds a way to make innovation budget-friendly. USB 3.0 is undoubtedly the new frontier of the interface’s technology with amazing read and write speeds that clock in at ten times those of USB 2.0. However, there’s one setback, a very important one: the price. It’s probably the reason why after a few years of industry buzz; USB 3.0 is still coming up just short of mainstream. Now, if you’re a techie, you’d probably consider SuperSpeed gadgets and systems to be worth the investment, but what if you’re not so techie? That is the reason why Super Talent, a top manufacturer for flash storage solutions and DRAM memory modules based in San Jose, California has come up with the USB 3.0 Express ST2, a flash drive with same great features as other SuperSpeed products but with a price similar to those of USB 2.0. Now everyone can get a chance to experience the capabilities of USB 3.0 without having to sacrifice their budget! Although the price of the Super Talent USB 3.0 Express ST2 is cheap ($20 for 8GB), it is anything but a cheap USB product in quality. In fact, the company offers a lifetime warranty to back the storage device’s 67MB/s read and 24MB/s write speeds. The Super Talent flash drive is both future-proof for USB devices still to come to the market as well as offering backward compatibility with USB 2.0. This Super Talent USB 3.0 flash drive model looks really similar to USB 3.0 Express DUO, but with the ST2 you have a different option in case design. The USB stick is enclosed in a glossy metallic housing with a clear blue plastic piping. Additional plastic trim is featured on the USB cap as well as the blue LED which indicates data transfer activity. There is also a key ring attachment at one end of the device. Combined with the look and function, this USB 3.0 flash drive will not only seamlessly blend into Super Talent flash drive family, but into mainstream use. The Super Talent USB 3.0 flash drive comes in 8GB, 16GB and 32 GB capacities with prices starting at $20. With its competitive price and performance, do you think the Super Talent USB 3.0 ST2 will be a hit? We’d love to read your comments below! 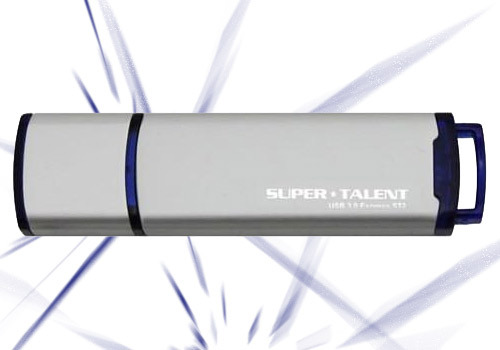 This entry was posted in Articles, Super Talent Technology, Super Talent USB 3.0 Flash Drive, SuperSpeed USB 3.0, USB 3.0, USB 3.0 Flash Drives and tagged Super Talent Express ST2 USB 3.0 Flash Drive, Super Talent USB 3.0 Express ST2 Makes Debut, SuperTalent Express ST2 USB 3.0 Flash Drive Launched, SuperTalent USB 3.0 Express ST2, SuperTalent USB 3.0 Express ST2 USB 3.0 Flash Drive, USB 3.0 Express ST2. Bookmark the permalink. I wanted to say that the mentioned speed is very inferior for true USB 3.0 Flash Drive Device. Especially the write speed, it’s a very weak device. The minimum read/write considered for USB 3.0 USB Flash Drive is 60MBytes/s both ways. Nowadays typical USB 3.0 Flash Drive offers 60-100MBytes/s read speed on average and 40-80MBytes/s Write speed. And this is where the low price comes from.